Sam checked out the movie Ponyo from the library. We were really excited to see it, because another Miyazaki film, Spirited Away, is one of our favorites for giving a balanced and realistic view of what childhood is like, or can be (granted, within a completely fantastical environment). 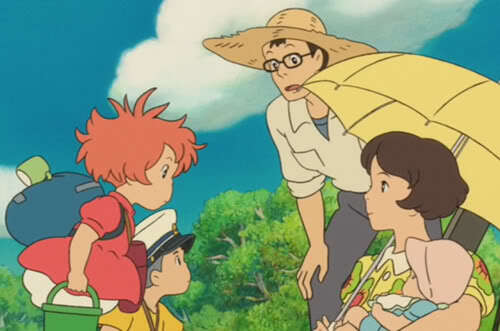 One thing I appreciate in Hayao Miyazaki's cartoons is that he shows children as capable and inventive but flawed and open to learning, and his "villain" characters are nuanced and revealed to be not villains after all. So...we were pleasantly enchanted with Ponyo. It's a story loosely based on Hans Christian Andersen's The Little Mermaid that follows a goldfish (Ponyo) who becomes human after befriending a boy on land. Anyway, there was one interaction in the movie that seriously made me gasp. I had to rewind it and try to write it down to share with you, because it was too wonderful. I might not have transcribed it verbatim, but here's the gist as far as my shorthand would allow. 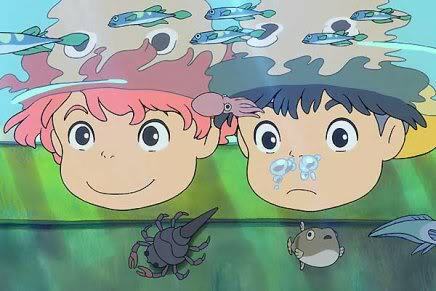 Ponyo and the boy, Sōsuke, are out on a boat to look for Sōsuke's mother, who went to help out at the senior home during a big storm and flooding the night before. They come across another boat with a young family — a mother, father, and infant baby. Ponyo is taken with the baby and offers some soup in a cup. "Oh is that for us?" says the mother. "... Well, thank you. It smells good." She tastes it. "Wow, that's good soup. Thanks!" Sōsuke cuts in to say, "My mom made it from scratch." But Ponyo's annoyed. She points to the baby. "The soup's for him," she says. The baby's mother says, "Oh, I'm sorry. He's a little too young. He can only eat milk at this age." She smiles reassuringly at Ponyo. "But I can eat the soup, and it will help me make milk for him." Sōsuke chimes in cheerfully, "Yeah, my mom made me milk, too." Ponyo considers this as they begin to boat away. She gets a pile of sandwiches out of their supplies. "Here, have some milk," she says, shoving them into the mother's face. "It's for milk!" she calls. Seriously, how adorable is that? I love that it's positive and matter of fact, and that kids watching will hear a factual and affirming message about breastfeeding. Notice that the only character in the conversation who is befuddled by breastfeeding is a goldfish-turned-human, who can be forgiven for being confused by our mammalian ways! Incidentally, according to the IMDB message boards, the original Japanese term translated with "making milk" in the English version was more like "giving him boobies." I wish I knew how the whole conversation went in a literal translation! I think the way they ended up translating it for English audiences, though, was perfect. Just completely normal and natural. If you know of any other instances of breastfeeding in children's films or books, please share so I can increase my library! I was excited to see this post...and especially after you re-told your favorite part! I rented this for the kids during spring break, and although I didn't watch the whole thing, I did see this part and thought it was so sweet! I also liked that it was natural, the way it should be! We had to buy this one. It's sooo good. I love Miyazaki so I'll have to look for this. the kids love his Heidi. awesome! we have spirited away and i was curious about this one too, convenient that you reviewed it for me ;) extra love the breastfeeding reference. When my husband and I were watching this together (and for our first time seeing it), when the "making milk" part came, my husband turned toward me with a huge, cheesy grin on his face. He knew that I like the movie right away, just because of that one scene!!! What a sweet and positive message. Have to remember to see that sometime with my girl! 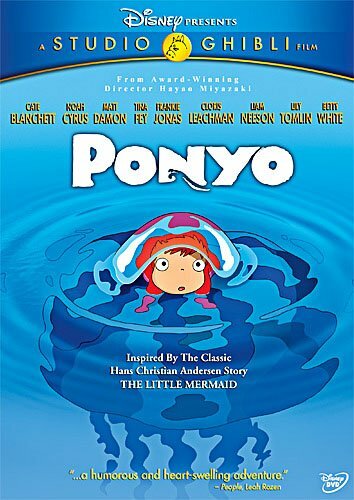 Ponyo was the first (and only) movie my 6 year olds have seen in a real cinema. We now have it on DVD and we all LOVE it. You description of how Miazkai features children and his villains (my girls got that point that Ponyo's Dad seemed like a baddy in the beginning but he was just scared and trying to do the best for everyone and was a goodie in the end) is spot on.. and the fact that breastfeeding was just a regular part of conversation in this movie is an added bonus!